If you have any questions or suggestions you are welcome to join our forum discussion about Other Types of Signal Bars and Patterns. In the previous articles of our price action guide we’ve underscored the reversal bar as one of the most reliable signal bars, followed by double-candle reversal patterns and their variations such as triple-candle and four-candle reversals. Other types of bars that could generate an entry signal are candles with small ranges, exhaustion candles and micro double top and bottom formations. Small candles are basically ones with smaller range compared to the previous candle and indicate lack of enthusiasm by both bulls and bears. An example for those is the inside candle. It basically has a low above the low of the previous candle and a high, which matches or is beneath the high of the previous one. It can also have a low at or above the low of the previous candle and a high below the preceding one’s high. Small candles are most reliable if they are counter-trend and less reliable, if they are large dojis, since those usually precede sideways trading. 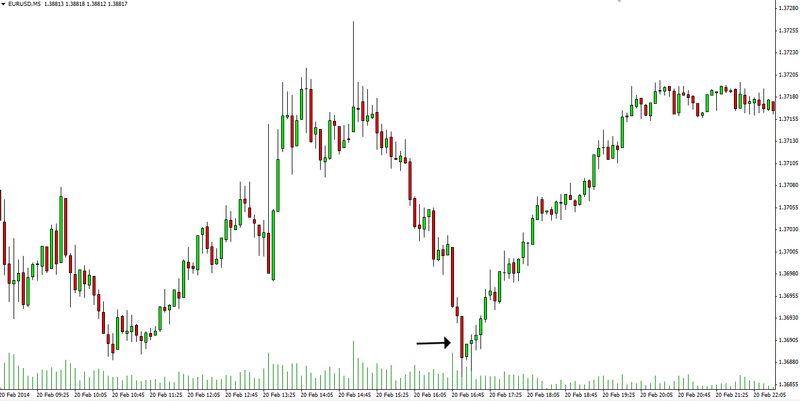 To learn more about doji candles, check out our Doji article. When an inside candle is formed after a big trend candle breaks out of a trading range, it can mean two things – it can simply be a pause by the with-trend traders, or it could represent loss of courage that will end with a reversal, thus rendering the breakout failed. The chance for a reversal improves, if the inside candle is a trend candle in the opposite direction. There are a couple of things a trader needs to consider when that happens. If, for example, we have an upward breakout during a downward trend, the traders usually place a buy order above the inside bar and a sell order below it. The executions of one order makes the other the protective stop. If prices drop and the sell order is filled, then the trader should double the size of his buy stop order, in case the failed breakout becomes a breakout pullback. However, if the long order gets filled, the trader should not reverse on his protective stop. During a strong trend, small candles can also be used for with-trend entries. In a strong uptrend for example, a bullish inside candle close to the high of a large bullish trend candle is a good long entry signal. However, if we have a small candle that extends above the bullish trend candle’s high, it could by treated as a long setup, but only if the trend is strong enough. 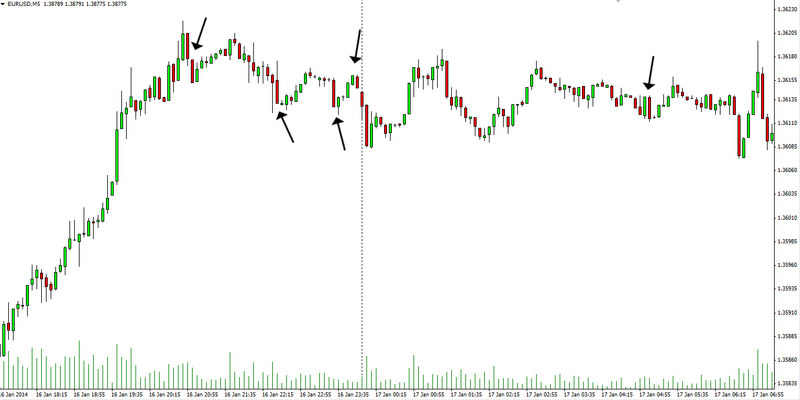 Another example of small candles that can act as reversal signals are the inside-inside and inside-outside-inside patterns. The inside-inside pattern consists of consecutive inside candles where the second is basically engulfed by the first, which itself is an inside candle. The inside-inside formation is always a clear reversal on a smaller time frame. You can see one on the following screenshot. It is a breakout setup that can become a flag or a reversal formation. A variation of the inside-inside pattern, which is also considered as a bit more reliable is the inside-inside-inside pattern, which comprises three consecutive inside bars. Usually, a with-trend breakout form an inside-inside pattern is followed by a short movement, often just a scalp, and is likely to reverse. Conversely, a breakout against the trend often leads to a larger reversal. The protective stops in an inside-inside pattern are beyond the opposite end of both bars, which make up the pattern. You can also have the so-called inside-outside-inside formation, which, as you can guess, is made up of an inside candle, followed by an outside and another inside candles. Because it is often a breakout setup, traders relying on this pattern should enter on the breakout above or below the second inside bar, with the opposite being the right spot to place a protective spot. Another possible trend reversal might be indicated by the formation of a micro double top or micro double bottom. They consist of consecutive or almost consecutive bars with matching or nearly identical low or highs, respectively. The micro double top formation can produce a with-trend signal when it forms in a bull spike and consists of a bull trend candle closing at or near its high, followed by a bear trend candle opening respectively at or near its high. This is a single-candle bull flag. If the highs are identical, you should buy a couple of pips above the high, and if not, it is likely a reversal pattern. Logically, a micro double bottom is the opposite. It forms during a bear spike and comprises two candles, a bearish trend candle that closes at or near its low, followed by a bullish trend candle opening at or near its low, thus forming a single-candle bear flag. Interpretation is also identical to the micro double top, just the opposite. You can see a micro double bottom visualized on the following screenshot. We’ve already mentioned in the article “ Price action spectrum. Trend candles” that although usually trend candles generate signals for with-trend entry, sometimes they can also precede reversals. An extraordinary large trend candle in the trend’s direction can sometimes reflect emotional exhaustion among the controlling bulls/bears. This is basically a buy/sell climax. Check out the following screenshot. The climactic exhaustion nature of unusually large trend candles basically represents a situation when the last buyers or sellers in the market are buying/selling in panic, because they had to hop on at any price. At the same time, those who were in the opposite direction wanted to get out at any price not to withstand further losses. If no other buyers/sellers support the initial movement, then the market will eventually reverse. Unusually large candles signify exhaustion especially when the market has trended in a distinct direction for at least 10 bars and is expected to reverse or correct for at least 10 bars. Keep in mind, and we’ve mentioned that before, that most often first breakout attempts fail, trapping traders who believe the move will be strong enough. This is observed very often on quiet days when the market is trading sideways and the price is bouncing up and down from the boundaries of the range, trapping market players who expect a breakout to occur. A candle which lacks wicks (or shadows) at one or both of its extremes generates reliable with-trend signals, but only during a strong trend. When a trend candle in the direction of a strong trend has no shadows, or as some call them “shaved”, it indicates that either the bulls or bears are in almost full control and the market is in a strong trend. A perfect shaved candle has no shadows at all, indicating that the bulls/bears have pushed the price from the bottom to the top and vice versa. If there is a wick beyond one of the extremes, then the signal would be stronger, if the extreme strength is right into the close. For, example, if we have a strong bullish candle within a bull trend, it would be better if the top is shaved, and not the bottom, because that would give us a more definitive proof the upward movement would continue and we can enter a long position above its high. Logically, the opposite scenario – go short below a shaved bottom of a bearish candle in a strong bearish trend, is also valid. You can see several of those in the following example. If our bullish trend candle however has a small shadow above its close and a shaved bottom, it is still a show of strength, but it is not advisable to be the sole base for a long entry. Same goes for the opposite market direction. You should keep in mind that shaved candles are reliable signal generators only during strong trends, because trading ranges tend to test extremes repeatedly and the chance of a rebound off support and resistance zones is greater than an actual breakout. When volume is low, wickless candles occur commonly and logically don’t indicate any strength. You should avoid betting on them, if you see too many on your chart.